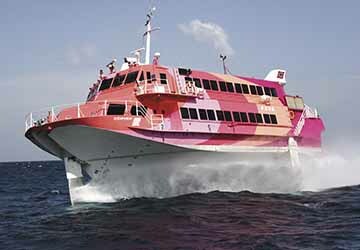 Tokai Kisen’s Seven Islands high speed jet ferries are all colourfully designed by famed illustrator Ryouhei Yanagihara. These ships reach a top speed of 80km an hour. Duee to their design, the vessels are largely unaffected by wave action and are therefore great for travellers who usually experience seasickness. Please Note: Whilst we have taken great care in making our Seven Islands Ai guide as accurate as possible, onboard facilities, services and entertainment may vary depending on the date and time of year that you travel, facilities mentioned may change without notification and ferry companies reserve the right to operate vessels other than those mentioned at time of booking without prior notification.